Considered a very hardy conifer, the Juniper is a non-flowering tree that makes a great choice for bonsai because of it is so easy to prune and train. Originating from China, it is one of the most popular types of bonsai trees and is a firm favorite of many bonsai enthusiasts. There are many different varieties including: Japanese Garden Junipers, Green Mound, Sargent's, Needle, Shimpaku, and Chinese Junipers; all varieties being equally beautiful. Junipers are also one of the easiest forms of bonsai to take care of. Following a few simple guidelines allows a Juniper Bonsai to be grown without difficulty; as such, they are perfect for beginners and will enable one to develop their bonsai into a magnificent work of art with only a little patience and tender loving care. The Juniper is a low growing plant, producing lush greenery and small, firm, silvery blue berries atop interesting bark that adapts well to several creative forms of Bonsai bark manipulation. Its compact foliage makes it one of the best candidates to become a Bonsai. Junipers grow slowly and are very long-lived. This Juniper will grow with outstanding beauty, remaining green throughout the year. An advantage to using the Green Mound Juniper for Bonsai is that because of the degree of hardiness, this tree can remain outdoors, even in the winter months; although it should not be exposed to temperatures below 35 degrees. One of the most important aspects of growing the Juniper outdoors is that the root ball should be carefully protected from frost, as should newly wired or trained trees. Juniper Bonsai should be kept in a cooler environment during the winter months in order to experience a winter rest period in order to maintain good health. During this period your bonsai should be protected from drying winds and extremely cold conditions. Green Mound Junipers are considered outdoor trees. They require a great deal of direct sunlight, changes in temperature, and humidity. When kept outside it can tolerate just about any condition, but don’t let it freeze and make sure it gets afternoon shade in the summer. Filtered or shaded sunlight outside is best for your Juniper bonsai. Allow your Juniper bonsai to get low intensity morning sunlight when possible and avoid the direct afternoon sunlight. Green Mound Junipers love lots of bright light with a minimum of four hours direct sunlight a day. This type of juniper tree will grow best in full sun to semi-shade, making it easy to find an acceptable place for it to thrive. Junipers, as with most bonsai, like to dry out between being watered. You will want to feel the soil every day in order to assess its moisture levels. If there is a rock in the planting lift it up and feel under it, otherwise, just stick your finger about a half of an inch to an inch into the soil. If the soil feels dry, it is time to water your bonsai. You will want to ensure that your Juniper is not allowed to go completely dry for extended periods. When you water your Juniper, water it from the top, wait a few minutes, and water it again. Repeat this several times to insure that your bonsai has received a thorough watering. 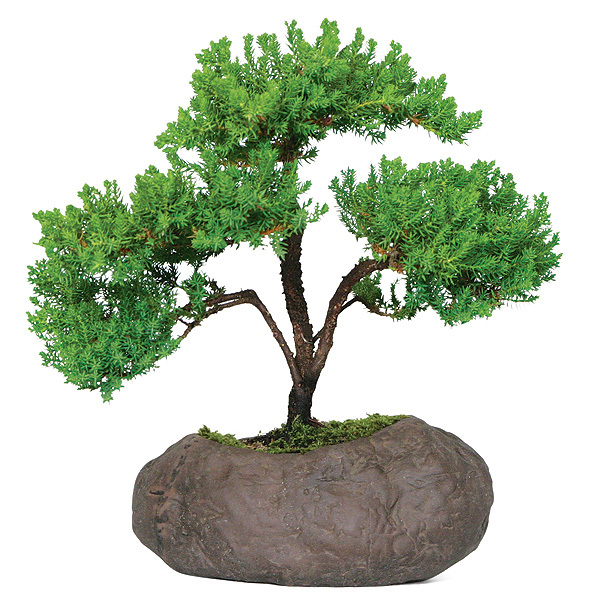 Humidity around your Juniper bonsai may be maintained by the use of a humidity tray filled with stones and water. Place your Bonsai on top of the stones in the tray. The tray or plate will also offer protection from the draining water of your freshly watered bonsai. Misting once a day will also help…but remember, misting is not a replacement for watering. With rapid growth patterns, The Green Mound Juniper is typically seen with long, flowing branches that can be trained in just about any bonsai style with the exception of the broom style. Most often, the Juniper’s branches respond exceptionally well to wiring and reshaping. Just keep in mind that because the bark tends to be stiff, trying to shape into something other than its natural form can be challenging, although not impossible. Major pruning should be performed only in the springtime or early fall, never during the hot summer months. However, maintenance pruning is acceptable all season long, and on a regular basis, young shoots should be pinched off. To develop the foliage, pinch out the tender new shoots using your fingers. Do not use scissors, as the cut needles will turn brown. Prune undesirable branches (especially those growing straight down from their parent branch) when repotting or during the growing season. Junipers have a low, spread that makes them ideal for cascade and semi-cascade styles. When shaping your bonsai, use the thinnest training wire that will hold the branch in the desired position, taking care to remember that it is never a good idea to wire a bonsai immediately after repotting. Wind the training wire in the direction the branch is bent in order to keep the wire from loosening. Wrapping the wire too tightly will cause scarring. Begin at the base of the Bonsai tree and slowly wrap the wire around the trunk to anchor. Continue along the branch you wish to train. Repeat the process as needed. After about 6 weeks, the branch should be able to maintain the shape on its own, and the wire should be removed. Cut the wire carefully from the branch rather than trying to unwind the wires as this could cause the branch to break. Wiring is best done in autumn or early winter, so that the branches can become accustomed to their new position while the tree is dormant. Wiring done at other times must be watched carefully for signs of wire cutting into the bark, and must be removed immediately if this happens. If necessary, the tree can be re-wired after removing the old wire. One of the best characteristics of Juniper Bonsai is its hard resinous wood, ideal for advanced sculptural techniques such as Jin, Shari and sabamiki. Because the Juniper tree has needles, that when poked through the skin, can create an allergic reaction, it is highly recommended that you wear gloves to help avoid any red, itchy rash. Junipers are prone to spider mites. You can spot spider mite trouble by the discoloration of foliage, which will usually turn gray at the tips. If you suspect an infestation of spider mites, you can place a clean sheet of white paper under the branches of your bonsai and gently tap the foliage. If tiny specks will fall onto the paper watch them carefully for a moment and see if any of them get up and try to leave. A moving speck is probably a spider mite. Use a mild insecticide that lists spider mites. It usually will take a few applications of insecticide to get the job done. Spider mites rarely do significant damage. Junipers are also susceptible to fungus problems, especially in shadier, darker and cooler spots. If your Juniper develops discoloration of the foliage that is black or a pale lavender/grayish color, you are safe to suspect a fungus problem. You can easily prevent fungal problems by keeping your bonsai in a well-ventilated area where proper cell growth will be encouraged. Fungus problems are more likely during the dreary, wet fall and winter days and into the soggy spring days. Because Juniper seeds take up to five years to germinate and are very difficult to grow in that way, most people propagate Junipers from cuttings. In the summer, start softwood cuttings under mist (use a fungicide) and supply bottom heat. Ripe-wood cuttings taken in fall and winter can be started without the mist or bottom heat. Junipers should be repotted about every two years when young (less than five or six years old) and every three to five years thereafter. Junipers may be repotted throughout most of the year, although, the best times for repotting are in the spring and fall. Gently remove the plant and root ball from the container. If the tree has been wired, simply clip the wire and gently remove. Then, gently trim the root ball using sharp scissors, removing the bulk off from the sides and bottom, usually to about one half inch and taking care to not remove more than one third of the roots. Replant the Bonsai in a clean pot, using well drained soil. After repotting, water thoroughly and keep the plant in a shady location for several weeks so that new roots may grow. The tree should be protected from wind and direct sun for a month or two after repotting. Native Americans, including the Blackfoot, Cheyenne, Crow, and Ojibwa, made tea from the hard berry-like fruits of the Juniper, and used infusions of it to treat kidney diseases, colds and sore throats. They also burned creeping juniper as incense in ceremonies. Modern herbalists and Naturopathic Physicians use essential oils from the related J. communis to treat urinary tract infections, and report that it is useful in treating rheumatism, arthritis and gout. Herbal use dates back to early Greek and Arabian physicians.